Spring Road Clearing is Underway in GTNP Read More HERE. And depending on an overnight freeze, the crust has been skiing well. With Wednesday’s warm daytime temps, you may need to wait until we get 1-2 nights of temps in the 20s. Webcam with views of the Taggart end of the trail and the Grand Teton are on JHNordic.com . Check out snow and road conditions for the spring! 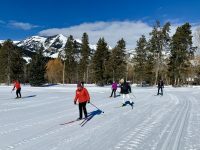 Groomer’s Comments – Turpin Meadow Ranch has closed for the winter season. Last trail grooming day was March 4th. 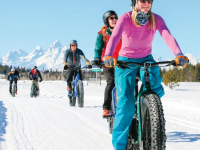 The trails are open to skiers, fat bikes, and snowshoes, however, there will be no grooming, so expect to break trail. Some trail may continue to be packed by passing snowmobiles. The TMR Lodge is closed until late spring. See you this summer or next winter! Groomer’s Comments: Conditions continue to provide excellent Nordic skiing. Look for light snow to fall over the next several days which should make for an enjoyable outing. Another update will be sent once conditions change. Enjoy! Groomer’s Comments – Tuesday morning: An inch of new, cold, snow, allowed both classic and skate tracks to groom out well this morning. 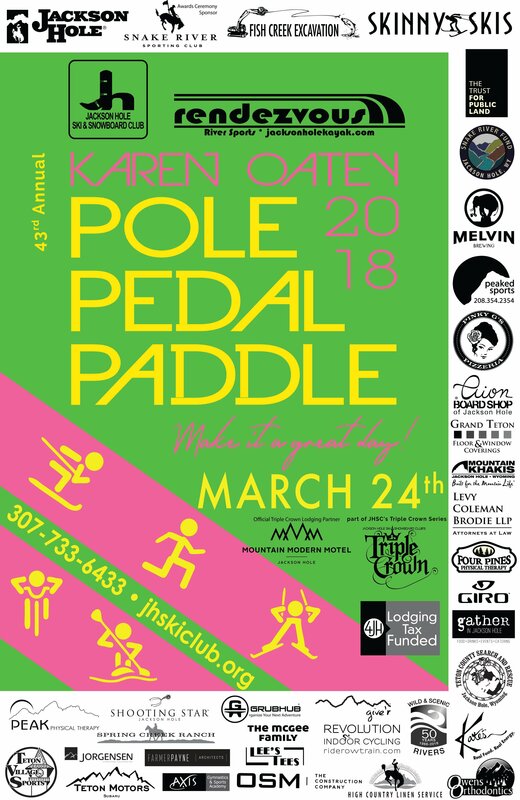 Single Track Conditions (Updated 3/10) – Get out early while the temps are cooler. Groomer’s Comments – Groomed skate lanes and set classic track late Wednesday night. Temps were still above freezing so it’s a little soft but should firm up by morning. Track is still 100%. Go get it while we still got it! 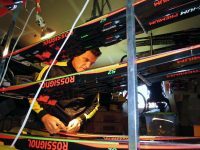 Groomer’s Comments – Looks like the season is over. Partial snow cover, and firm, not to sat icy. 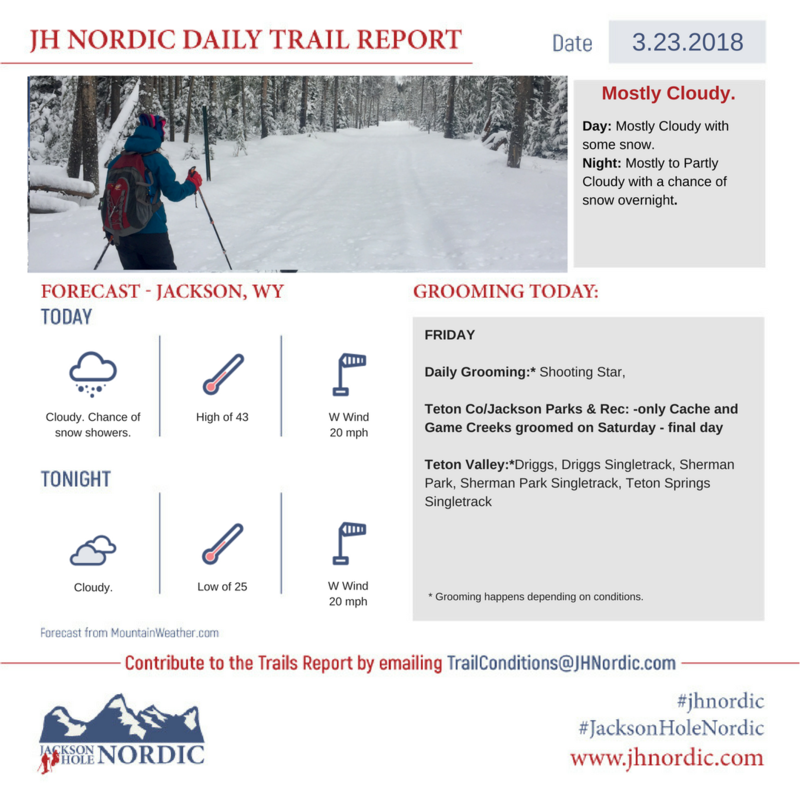 Single Track Conditions (Updated 3/18, 7:22pm) – Excellent. Laid down a sunset groom. Already fast and firm, should be bomber in the AM! Probably best to avoid midday if warm. Go ride!!! 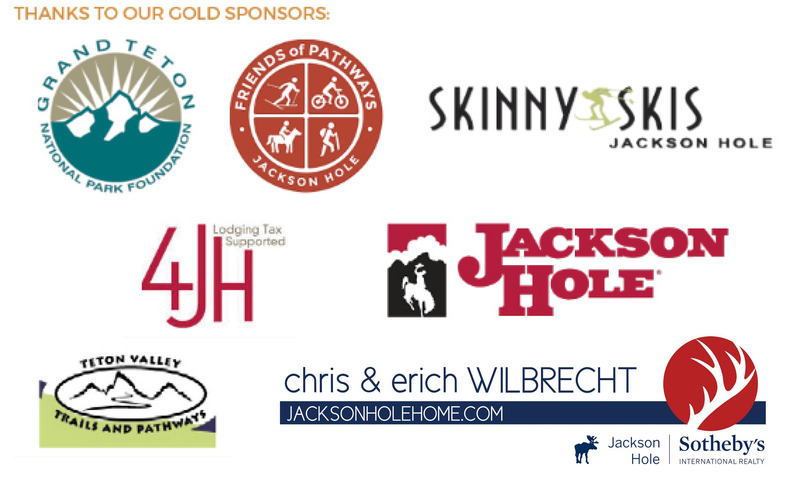 Community-supported grooming, with the support of the JH Nordic Alliance, GTNP Foundation, Skinny Skis, Dornan’s, Prugh Real Estate, and many generous donors help to make this grooming possible. GTNP Groomers will add an extra day each week, based on available resources. 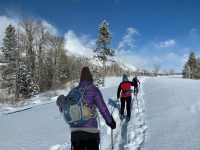 Daily Trail Report | Seize the Season While it Lasts. Spring Skiing Blog From Friends @ TVTAP. Daily Trail Report | Season Winding Down. Still plenty of Opportunity! What’s in Your (Nordic) Pack? © JH Nordic. All rights reserved.